Japanese oil refiners Idemitsu Kosan and Showa Shell Sekiyu are to merge on April 1 next year. This comes after Idemitsu’s founding family dropped its long-standing opposition to the plan. The companies will merge via a share swap, and Showa Shell will be delisted on March 29. The combined firm would account for about 30% of Japan’s domestic gasoline sales, second only to JXTG Holdings, which controls about half the market. Idemitsu, which is Japan’s No.2 oil refiner by sales, has long been keen to merge its operations with fourth-ranked Showa Shell in response to shrinking gasoline demand in the country. But it was locked in a battle for about two years with the Idemitsu founding family, which argued the two firms were too different for any merger to work. As part of the deal, the founding family will be able to nominate two of the eight initial directors of the merged entity. The share swap will be conducted for the 68.75% of Showa Shell shares that Idemitsu does not own. Idemitsu has a market capitalisation of 792.5 billion yen and Showa a market capitalisation of 578 billion yen. 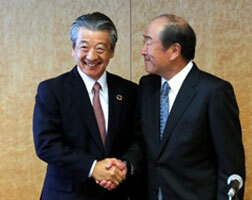 According to Showa Shell Chief Executive Tsuyoshi Kameoka, 15% shareholder Saudi Aramco is supportive of the merger. The two firms will target net profit of at least 500 billion yen for the total of three business years from 2019, and plan a payout ratio of 50%. The merged firm will use Idemitsu Kosan Co as a company name but will conduct business under the trade name, Idemitsu Showa Shell.